If you’re looking for a cake that visually looks good this is one for you. When I brought this out at our tea party, there were lots of “Ooohs” and “Aaahs” from the children. I was disappointed with my sponges as they didn’t rise very much. One day I will succeed in making a well-risen Victoria sponge. I think it might have been the all-in-one method that was my downfall. Luckily the cream, fruit and meringues helped to distract from this. 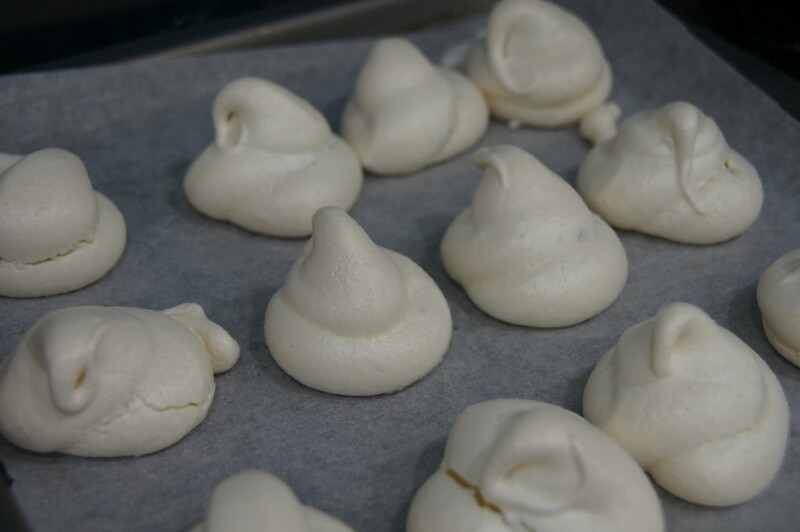 This recipe requires you to make your own meringues but you could of course by some if you’d rather. 1) Heat your oven to 190C/Fan 170C/Gas 5. Butter two 20cm sandwich tins and line with non-stick baking paper. 2) Begin by making your sponge. In a large bowl, beat all the cake ingredients together until you have a smooth, soft batter. Divide the mixture between your two tins, smoothing the surface with a spatula or the back of a spoon, then bake for about 20 mins until golden and the cake springs back when pressed. Turn onto a cooling rack and leave to cool completely. 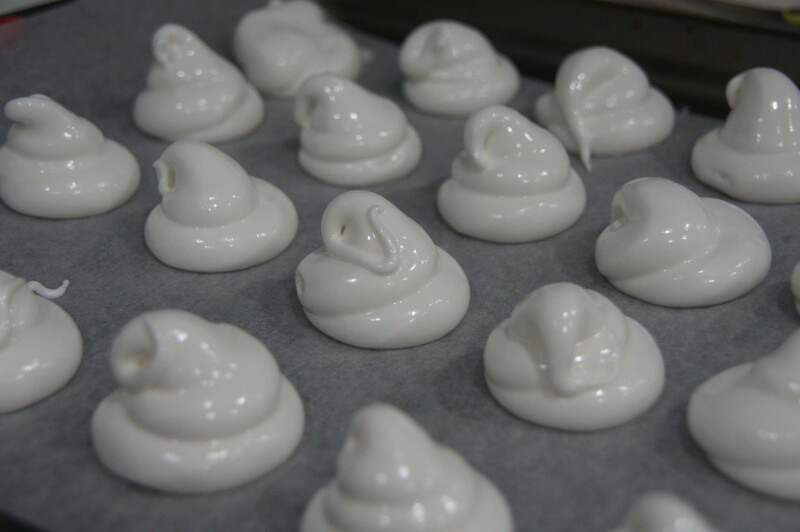 3) Then make the meringue kisses. Line a rimmed baking sheet with parchment paper, pour in the sugar and bake for about 5 minutes at 200C until the edges just begin to melt. 4) Meanwhile, pour the egg whites into the bowl of your stand mixer (making sure it’s clean) fitted with a whisk attachment. Whisk on low allowing bubbles to form, increase to high and continue whisking until stiff peaks form and you can turn the bowl upside down without the egg whites falling out. 5) Remove the sugar from the oven and begin whisking again at high speed. Add one big spoonful at a time, ensuring that the whites come back to stiff peaks after each addition. Once all the sugar is added, continue to whisk for 5 – 7 minutes. You should be able to rub the mixture between your fingers and not feel any grit from the sugar. You’ll know it’s ready to use when it forms a smooth shiny peak on the tip of your finger. 6) Decrease your oven temperature to 100C. Line a baking sheet with parchment paper. Place a dab of meringue on four corners of pan and press paper on top to hold it down flat. 7) Spoon the meringue mixture into a piping bag so it is packed in tightly. Snip off the tip of the piping bag about an inch in diameter and pipe kisses on to your baking sheet. 8) Bake at 100C for 30-40 minutes until the kisses can easily be lifted off the parchment paper with the bases in tact. Leave to cool completely. 9) Next make the topping and filling. Combine the strawberries, raspberries, blueberries, vanilla and sugar in a bowl and set aside for 30 minutes (leave some fresh strawberries aside to cut with the stalks on to add colour). 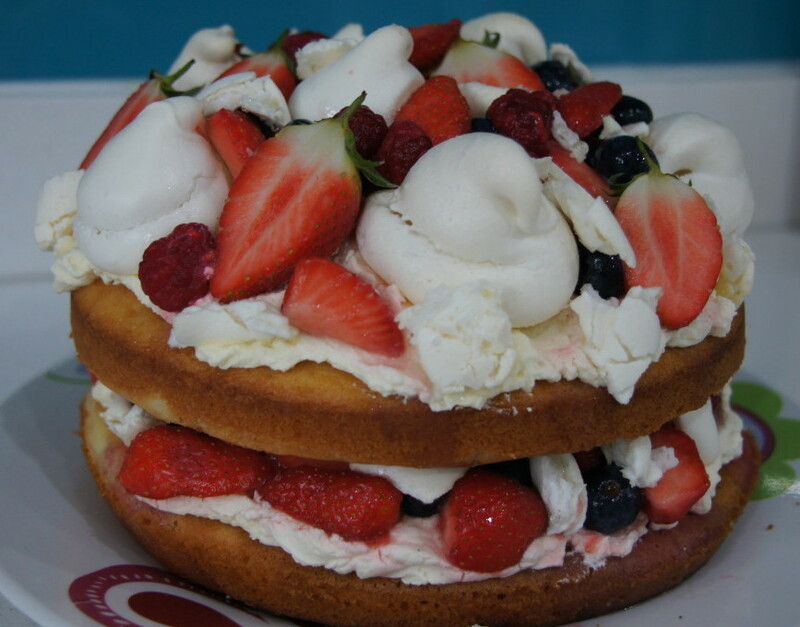 Whip the cream to soft peaks with the icing sugar. 10) Finally assemble your cake. Lay one of the sponge cakes face down, and spread over half the whipped cream. Spoon over half of the macerated berry mixture, and crush the meringue kisses on top (enough to lightly cover the whole surface). 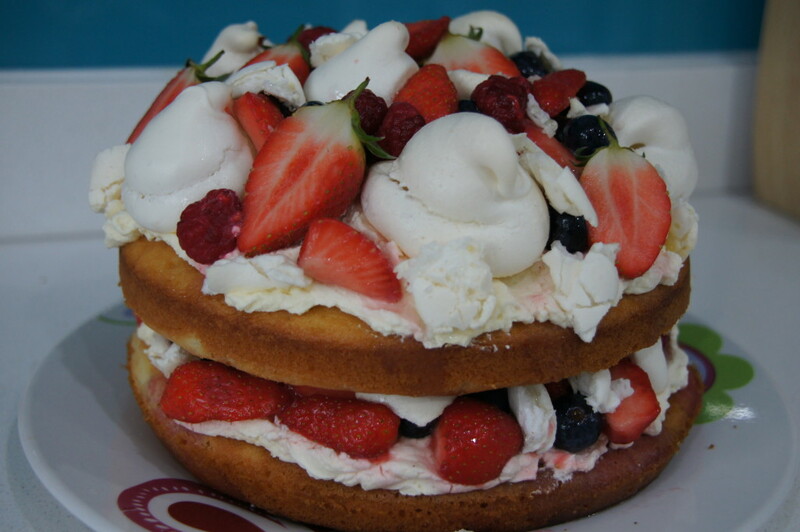 11) Place the other sponge cake, face up, on top, and spread over the remaining whipped cream, macerated berries (and fresh strawberries if you set some aside), some crushed meringue and uncrushed meringue, and sprinkle over some freeze dried raspberries. Step back and admire your masterpiece!